If anyone else with yellow hair and a missing front tooth at a bar told you they wanted to eat your smile, you’d probably want to quickly finish your drink and evacuate whatever grimy dive you’re sitting in. When New York-based Japanese action comic punk band Peelander-Z’s Kengo Hioki says it, it’s kinda like being tickled — you don’t like the idea at first, but you’ll soon be, well, smiling. “I eat your smile, I get energy, then I give it to you,” Hioki, who is better known as Peelander Yellow from the planet Peelander, says in a thick Japanese accent. 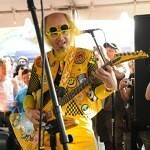 Anyone who has ever experienced a Peelander-Z show knows why letting Peelander-Z eat your smile is a good idea. 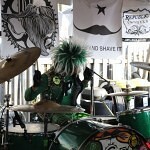 The band plays a brand of punk rock ranging from Ramones-esque pop to something sent from 1990s southern California on a skateboard. Had it taken a more conventional approach to its performances, Peelander-Z’s music would still keep heads bobbing along its many earthen tour stops. But that’s not the case. A typical Peelander-Z gig is more like if the Ramones were cast as the costumed superheroes in an episode of Mighty Morphin Power Rangers, in which the band had to battle a giant squid at a high school pep rally, and Andrew WK were subbing for Joey Ramone — it’s an audience-interactive, primary-colored, punk rock parody of not only Japanese culture, but of our own. But mostly, they bring the party. A typical Peelander-Z show features Hioki pumping up the crowd with hand-drawn signs — which are used to introduce many of the songs — and the signature call and response of, “We are Peelander… Z” (as the audience helps shout the “Z” and cuts the 26th letter into the air like Zorro with their arms). Then Hioki, bassist Kotaro Tsukada (Peelander Red), drummer Akihiko Naruse (Peelander Green) and live guitarist/producer Tetsuya Hayakawa (Peelander Elvis) rock some jam about mad tigers or karaoke parties. But before you know it, you’re in the middle of conga line and a limbo rope has appeared. Then the band rocks some jam about medium rare steak or how everyone is named Mike. Then trusty sidekick Yumiko Hioki (Peelander Pink) has cleared a path through the middle of the crowd with a flashlight, bowling pins have been set up, and Tsukada, wearing a giant squid suit, is diving headfirst into them. Then more songs, perhaps with the drums moved into the crowd. Then Tsukada is hanging upside down from second story rafters playing his bass (he actually did this at last year’s South by Southwest). Pots, pans, and drumsticks are distributed to everyone in the audience for a sort-of Carnival breakdown, as someone leads the samba with a shrieking whistle. And of course, toward the end of the show, signs are held up: “drummer wanted,” “bassist wanted,” “guitarist wanted,” and guys who haven’t picked up an instrument in 10 years scramble for the chance to go home and tell their wives they still got it. 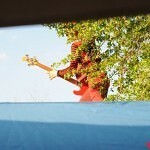 As you might guess, the scene is total chaos, yet somehow, the band and the audience merge into one harmonious entity. You see, while Peelander-Z is pretty good at playing punk rock, according to Hioki, who claims punk is the only music he knows how to play, his band is better at making friends. 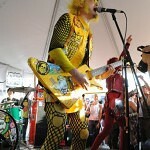 But Hioki said Peelander-Z doesn’t just want to selfishly make friends for itself, it wants to bring people together. Like in New York, he said, the punks don’t like the anime kids, and the anime kids don’t like the punks, but his band is the definitive nexus of both worlds. The more smiles the band gets, the more energy it gets, the more shows it plays, the more smiles we get, give, they play, etc. It seems like a good symbiotic relationship. But if for some reason Peelander-Z has to slow down, ease up on the smile intake for a bit, say, get off the road and record and album, rest assured it won’t be for long. 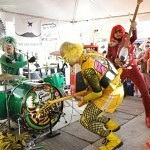 And if it is, Peelander-Z still has a most Japanese plan to continue bringing people together.